Have a heart! Really, I mean it. They taste great. Our local butcher, Allinghams, gets fresh stuff in from Smithfield on Tuesdays. 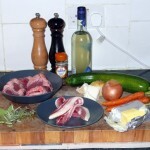 So I pre-ordered 4 lamb hearts last week and picked them up yesterday. 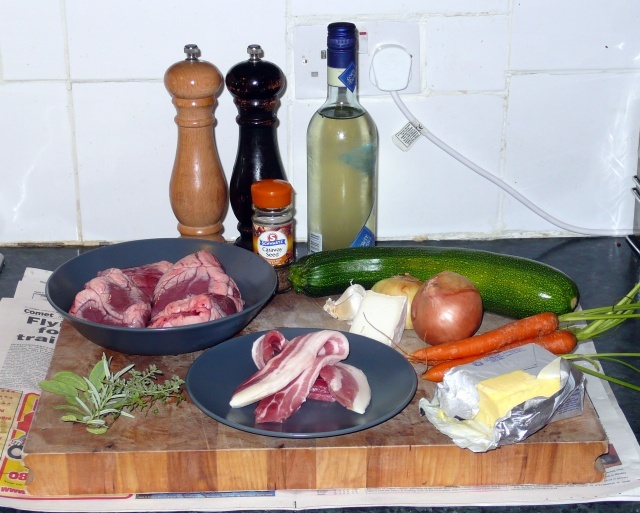 The first great thing about lamb hearts is that they’re damn cheap, in this case less than 3 quid for the lot – good value considering it turned out to be more than a dinner for the two of us. 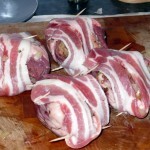 The second great thing is that they’re simply delicious, with a rich flavour somewhere between lamb meat and liver. A passing reference in Hugh’s meat book suggests using a wet stuffing, so I avoided anything like breadcrumbs and shot for plenty of fat in the form of butter, bacon, and cheese. Ah, the cheese! We picked this up at the Hitchin Tuesday farmers’ market from Wobbly Bottom Farm. They have goats and make a range of excellent cheeses from goat milk, the Mature Goat is particularly delicious (it’s like a slightly goaty parmesan), as is the Blue Goat, but in this recipe it’s the excellent Goat Camembert I’ve used (which is really much harder than a Camembert!) The only other difference here is that I decided to add something for sweetness, as this tends to work very well with offal. Originally I considered sultanas but I keep dried figs in the same box. For some reason the figs just felt right, the rest is history, or, more accurately, dinner. So, the ingredient manifest, some things here are listed twice where they’ve been used in different ways. First clean your hearts, for this I recommend a short and very sharp knife, best to start by sharpening it actually. Trim any arteries out of the top of the heart and slit, just deep enough to graze the muscle, along any veins on the outside of the heart. A book I have suggests removing such veins, but this seemed to be far too finicky to me. Next give your hearts a good rinse, especially flushing any clots of blood out of the cavities and flushing blood out of the veins you’ve slit. Thoroughly dry the hearts with some paper towel, giving them a good squeeze to remove excess water from inside. Now put them aside while you prepare the stuffing. Now is probably a good time to get the oven on, set it to 125°C. Dice the onion into pieces about 5mm to a side and get them sizzling in a heavy casserole with 25g of butter and the caraway seeds. 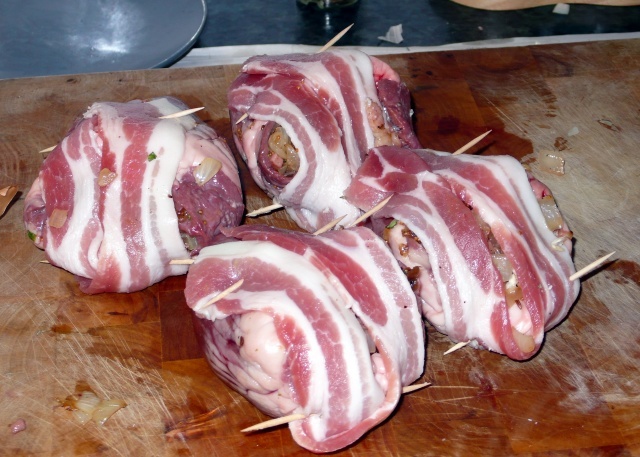 Slice the 2 rashers of streaky bacon into thin strips and add to the onion. Let this lot sizzle until it lightly browns. Very finely chop the garlic, sage, and rosemary and add to the pot with the pepper. Chop the figs into pieces about 5mm to a side and add as well. Now fry for about 5 more minutes until the fig pieces are softened. Turn off the heat and let it cool for a couple of minutes, until you can handle it. 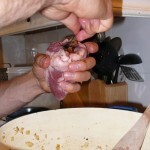 Divide the stuffing mix up into 4 even piles and proceed to stuff the cavities of each heart. A teaspoon is a useful tool for this. 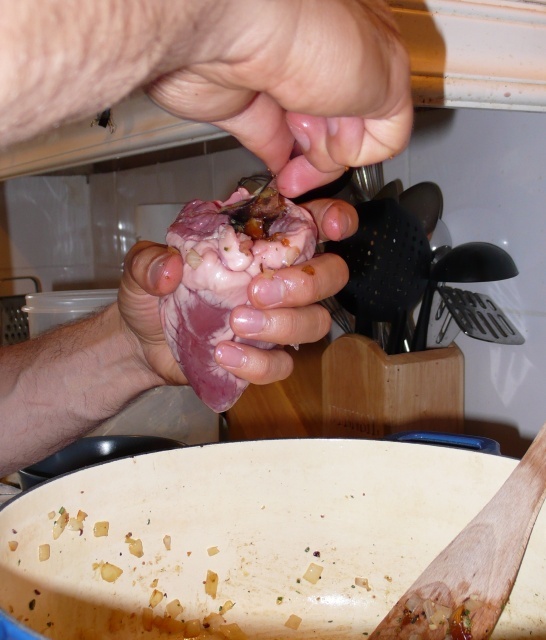 Once the hearts are stuffed there should be about a tablespoon of assorted stuffing left over in the casserole, this will help flavour the sauce. Slice your cheese into 4 “spears,” chunky enough to push into the hearts without crumbling (it’s best to have the cheese in the fridge up to here as this will keep it a bit harder.) Thoroughly embed a spear of cheese into each heart. Add another 20g of butter to the casserole and over a medium flame lightly brown the hearts on as many sides as they’ll sit on. With this done ensure all the hearts are sitting with the bacon (cavity holes) facing upward and pour the white wine and chicken stock in around the hearts. Peel and roughly chop the carrots, toss them in, skin the garlic and thump it to death under the side of a knife, toss this in too. Finally submerge the thyme in the liquid, get it simmering over the stove, then pop the lid on the casserole and shove it in the oven! If you’re us the next thing to do is pop down to the local pub for 2 hours and have a couple of beers. 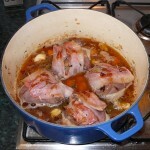 With 2 hours up take the casserole out of the oven and turn each heart cavity-side-down. They go back in the oven for another hour now. casserole onto a plate, carefully remove the toothpicks, and top each heart with a slice of cheese. These can now go back into the oven, but turn it off and leave the door slightly ajar (we’re just keeping them warm at this stage, not trying to cook them further.) It is also a good idea to pop a couple of serving plates in the oven at this point. 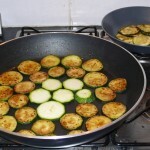 Pass the liquid and vegetables from the casserole through a food mill or push it through a course sieve. Place this back onto the stove and reduce over high heat until it reaches the consistency of runny cream. Be careful here, tasting the sauce regularly. The main issue to worry about is salt. 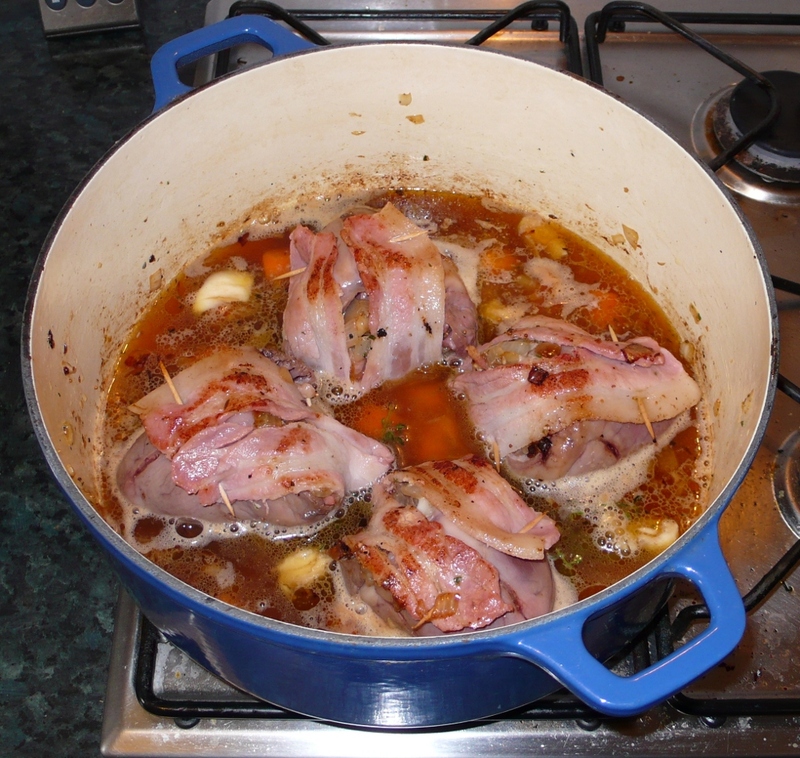 There may be a lot of salt in the sauce from the bacon and stock – good stock won’t have added salt, but most bought stocks do have some and stock cubes are very salty! If the sauce verges toward the salty side before it is thick enough you could try thickening it up a little with some cornflour solution. If it isn’t very salty then you can, as they say, “season to taste.” Finish the sauce by passing it through a fine sieve. Pop the hearts under a hot overhead grill to get the cheese just-sizzling. 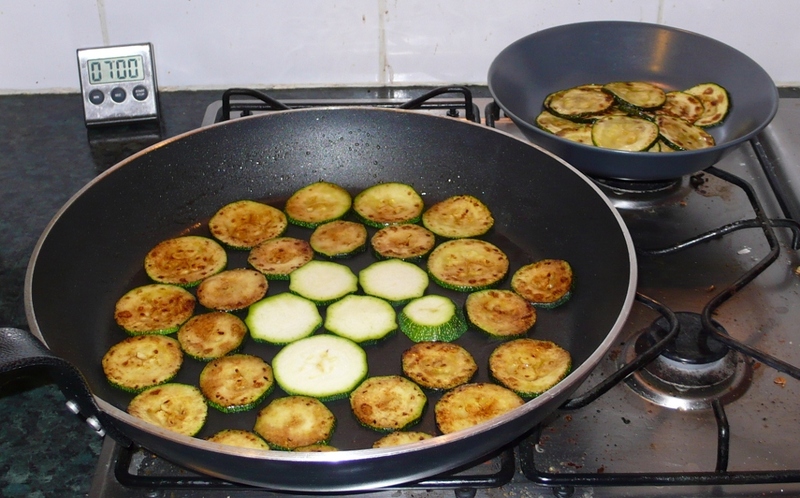 Create a bed of courgette slices on the two warmed plates and put two hearts on each plate. 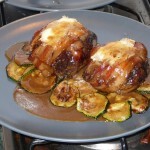 Drizzle with some sauce and serve with a glass of the wine used in the cooking and a jug containing any excess sauce. 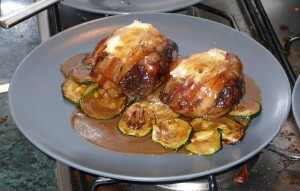 This turned out to be a rather rich meal so the dry white wine worked well as a balance. This is a large meal, two hearts filled me well and one was enough for Kat. An alternative would be to serve one heart per person, in which case I’d double the amount of courgette used and serve with something additional on the side, a small green salad maybe. 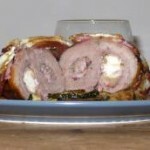 Another alternative presentation for the hearts is to slice them, since the cross-section is rather attractive. Our leftover heart will be prepared in this way and served cold as the centrepiece of a lunchtime salad. 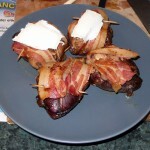 Stabbing a spear of Goat Camembert into the heart. Power gone again, preceded by about 10 minutes of highly flaky internet. If I was going to be spending all my time at home for much longer I think I’d be buying myself a UPS this week. It is seriously annoying to have 10 workspaces of state go up in smoke. At least Firefox comes back up as-things-were these days, as does Opera. I’m back to using good old screen for most off-site sessions now too. Doesn’t help with the local things though. Maybe I should be using the laptop as my primary home-machine. Woke up at 06:00, no power. Now 12:30… still no power. Again! And they’re digging up the new Audi carpark. Again! Co-incidence? No! Recently I had reason to rank the funds available via a Hargreaves Lansdown Vantage SIPP by their TER. Of course, it isn’t in HL’s best interests to make this easy so I ended up having to work it out the hard way. I’ve compiled a list that is correct as of around Friday August 1st, a portion of this is below. What I was looking for was a list of funds with a “real” TER of 1.1% or less. To get “real” I’m calculating the max of HL’s advertised TER and Annual Charge with their special magic additional charge factored in where it is applicable. HL add another 0.5%+VAT (0.5875%) to the AC for some funds, as far as I can see this mainly because they don’t like people investing in index-linked funds. I chose 1.1% as within this range, with appropriate investment weightings, you could put together a fund portfolio with an average TER of <1%, thus somewhat competitive with the stakeholder/personal pension options. I’ve also filtered the results to include only accumulation funds, and to leave out any funds where the net initial charge is greater than 0. My verdict? Given my filtering parameters the HL SIPP has about 60 investment options with which you could possibly put together a pension portfolio similar in overhead to good stakeholder or personal pensions. This typically has much more choice than a stakeholder, but less than many personals. However, it can be observed that the selection of investment choices mainly focus on local equities and bonds with a bit of money market thrown in. Notably this selection contains no property investment funds, which are generally considered an important part of a balanced portfolio (though how happy you’d be with that idea right at this moment is debatable!) I seems that the lowest TER property fund is the L&G General UK Property Trust with a TER of 1.29%, so if a small part of your portfolio it could be possible to include this and still average <1%. I don’t know if all these funds are valid for investment in a SIPP, I do know that their minimum investment levels vary (some are 1000+.) This is, after all, a fairly rough assessment made by a total armature! It is also worth pointing out that several funds in HL’s index link to “fund not found” pages, I have no idea what’s up with that. Additionally, few of the funds are index based anyway, so for the majority the usual quality considerations for actively managed funds apply. Finally, note I’m comparing an apple to oranges by taking into account just the parts of the apple that are orange-like. The important difference ignored here is that the HL SIPP allows equity investments with relatively cheap trading fees. If you want fully flexible trading within a SIPP then, from what I’ve heard, the HL SIPP is hard to beat. But my interest at the moment is comparing a SIPP to other options as purely a fund-container. The above said, it should be noted that the HL SIPP’s trading capabilities can also have some relevance to holding funds! This is thanks to ETFs of course.